I won't be posting my review of Kaki Warner's Pieces of Sky until the 30th, but I wanted to share a passage from the book. I haven't done a Mormon Mention in awhile, so I'll explain: As a member of The Church of Jesus Christ of Latter-Day Saints (commonly called The Mormons), I always find it funny/interesting/outrageous to see what non-members write about us. So, I like to share what I find along with my thoughts. What's the purpose of this little event? To laugh, to learn and to clear up misconceptions. "Shut up." Brady stomped over to the desk. Yanking open the bottom drawer, he grabbed his special bottle of Hannah Goodman's Red-Rye Whiskey, reputed to be the finest brew to come out of Mormon country and guaranteed to turn an ugly woman pretty, or a confirmed bachelor into a polygamist with a single sip" (243). While you count down the days until the 30th, click on over to Kaki's blog and read all about her. She's a warm, funny lady. 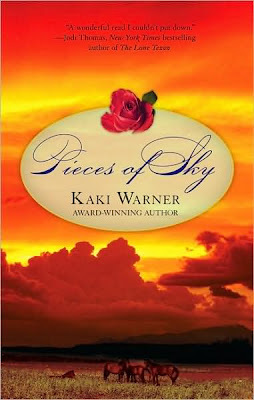 Pieces of Sky is her debut novel and the first in a trilogy about life on a ranch in New Mexico Territory during the 1860s and '70s. It's a western and a romance, but don't let that stop you - it's a very enjoyable read! Uh-oh. Am I in trouble? I swear I didn't make that up, but I came across that expression so many years ago I can't remember what book it came from. I did run it past my son and his wife--good Mormons, both, and they thought it was funny. (They're goofy, though). And in my defense, I didn't actually say Mormons made the brew or drank it, although some enterprising brethren might have cooked up Valley Tan, another old West whiskey that came out of the Henry Mountains of Utah. Sorry if I offended, but hey, I was a lot harder on the French. Not at all. It made me laugh!